These DTCs relate to the accelerator pedal sensor assembly. The accelerator pedal sensor assembly is mounted on the accelerator pedal bracket and has 2 sensor circuits: VPA (main) and VPA2 (sub). This sensor is a non-contact type sensor and uses Hall-effect elements in order to yield accurate signals even in extreme driving conditions, such as at high speeds as well as very low speeds. The voltage, which is applied to terminals VPA and VPA2 of the ECM, varies between 0.5 V and 4.75 V in proportion to the operating angle of the accelerator pedal (throttle valve). A signal from VPA indicates the actual accelerator pedal angle (throttle valve opening angle) and is used for engine control. 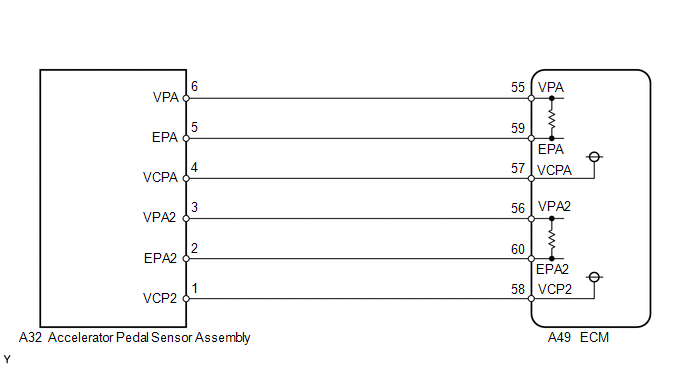 A signal from VPA2 conveys the status of the VPA circuit and is used to check the accelerator pedal sensor assembly itself. 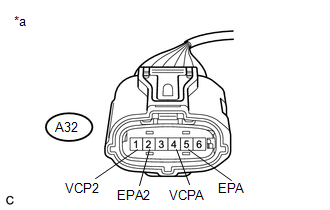 The ECM monitors the actual accelerator pedal angle (throttle valve opening angle) through the signals from VPA and VPA2, and controls the throttle actuator according to these signals. VPA fluctuates rapidly beyond the upper and lower malfunction thresholds for 0.5 seconds or more (1 trip detection logic). 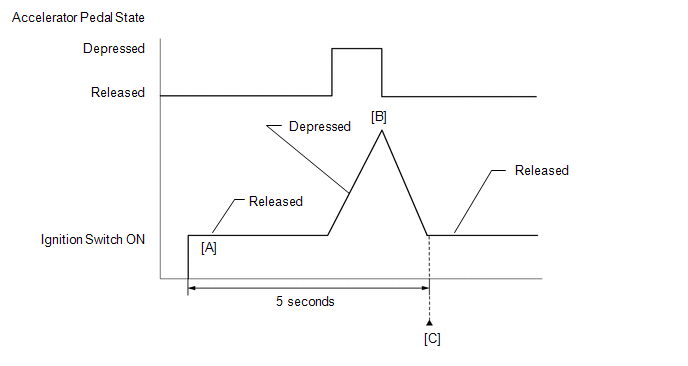 VPA is 0.4 V or less for 0.5 seconds or more when the accelerator pedal is depressed (1 trip detection logic). VPA is 4.8 V or higher for 2.0 seconds or more (1 trip detection logic). VPA2 fluctuates rapidly beyond the upper and lower malfunction thresholds for 0.5 seconds or more (1 trip detection logic). VPA2 is 1.2 V or less for 0.5 seconds or more when the accelerator pedal is depressed (1 trip detection logic). (a) VPA2 is 4.8 V or higher. (b) VPA is between 0.4 V and 3.45 V.
(a) The difference between VPA and VPA2 is 0.02 V or less. (b) VPA is 0.4 V or less and VPA2 is 1.2 V or less. When any of these DTCs are output, check the accelerator pedal sensor assembly voltage using the Techstream. Enter the following menus: Powertrain / Engine / Data List / Accel Sensor Out No. 1 and Accel Sensor Out No. 2. 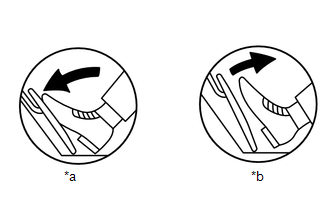 Accelerator pedal positions are expressed as voltages. 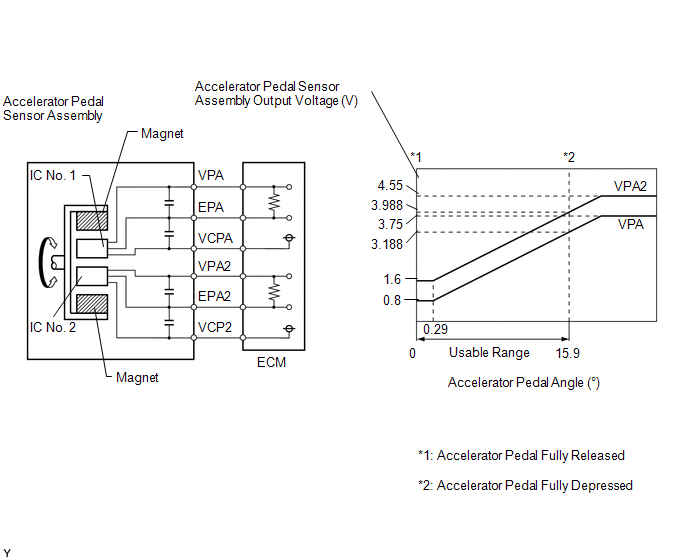 When either output voltage of VPA or VPA2 deviates from the standard range, or the difference between the output voltages of the 2 sensor circuits is less than the threshold, the ECM determines that there is a malfunction in the accelerator pedal position sensor. The ECM then illuminates the MIL and stores a DTC. When the output voltage of VPA drops below 0.4 V for more than 0.5 seconds when the accelerator pedal is fully depressed, DTC P2122 is stored. Fully depress and release the accelerator pedal [B]. Check that 5 seconds or more have elapsed since the DTCs were cleared. Input the DTC: P2120, P2122, P2123, P2125, P2127, P2128 or P2138. When any of DTCs P2120, P2121, P2122, P2123, P2125, P2127, P2128 and P2138 is stored, the ECM enters fail-safe mode. If either circuit malfunctions, the ECM limits the engine output. If both of the circuits malfunction, the ECM regards the accelerator pedal as being released. As a result, the throttle valve is closed and the engine idles. Fail-safe mode continues until a pass condition is detected, and the ignition switch is turned off. These DTCs relate to the accelerator pedal position sensor. (d) Enter the following menus: Powertrain / Engine / Data List / Accel Sensor Out No. 1 and Accel Sensor Out No. 2. (a) Replace the accelerator pedal assembly (See page ).